In 2004, people from rural communities in Brazil declared September 21st a Day of Struggle against Tree Plantations. During this year’s Day of Struggle, communities and social movements from Liberia, Nigeria, South Africa, Uruguay, Colombia, Indonesia and Malaysia will use the day to raise awareness about the many negative impacts these plantations cause. But what is wrong with planting trees? Do they not help mitigate the negative impacts of climate change? And prevent floods and offer other benefits? Well, it depends. Crucially, it depends on how and for whom the trees are planted. The Day of Action was created to protest against a specific way of planting and using trees: through seemingly endless monocultures of eucalyptus, pine, rubber or oil palm for industrial purposes like pulp and paper, rubber, food and energy production. Conflict over expansion of these industrial tree plantations arose wherever companies established them. By their very nature of being large scale and being grown as monoculture, they require significant amounts of water, agro-toxins, chemical fertilizers and fossil energy – and fertile land. Over the past decades, transnational companies have covered large tracts of fertile agricultural land and biodiverse forests in the global South with monoculture tree plantations. They counted on the support of governments of Southern countries, driven by the pressure to offer low production costs, enabling profit for the companies above those achievable with productivity of their plantations at home. Planting huge areas with one single tree species and of the same age has taken a big toll on the rich biodiversity in the global South. And because many more people depend on cultivating small plots to grow food for their subsistence, the social impact of large areas of fertile land being taken over by tree plantations has been equally high. Large-scale tree plantations in such a context deepen existing unequal land tenure and power relations and easily cause conflicts. 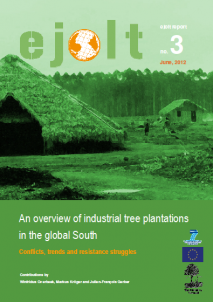 This can be seen at the EJOLT map on environmental conflicts that soon will be launched and gives an idea of the range and type of conflicts caused by large-scale industrial tree plantations in the global South. The issue has already been detailed in an earlier EJOLT report and summed up in this briefing. Corporate-friendly certification schemes have ´greenwashed´ millions of large-scale industrial tree monocultures as “socially just and environmentally adequate”. Schemes like the Forest Stewardship Council, FSC, and the PEFC have strengthened already powerful companies and justified their expansion plans. At the same time, certification has weakened the struggle of communities seeking support for recognition of their territories, agrarian land reform and strengthening of local and regional economies. The challenge is how to consume less and produce what needs to be produced in a way that guarantees the well-being of all. After all, ‘nobody can eat eucalyptus,’ a Brazilian peasant once said. How to promote social and environmental justice instead of insisting on expansion of export-oriented industrial tree plantations to promote more profits for a few corporations and their investors? A good start would be to stop imposing ever more tree plantations against the will of local communities and movements and support the local economies that disappear along with the biodiversity when monoculture tree plantations arrive in a region.